It's surprising to think that a street named after a humble 3x5 card could be so ostentatious, but drive along Index Street between Louise and White Oak on any December evening and you'll be dazzled by the number of houses with elaborate, twinkling Christmas light displays. The show continues as you wind through the neighborhood on Donmetz, Lahey, Encino, "Candy Cane" Lasaine, and Jellico streets. This density of decorating can't be an accident, I assume; it looks like an agreed-upon, coordinated effort. And in fact it is, but only in part. This neighborhood light display grew somewhat organically -- one house started up, and then the house across the street from them, and so on, and so on. And ground zero for this explosion of Christmas cheer is Cheryl Ford's house on Jellico Avenue -- the one with the Ferris wheel. It's interesting how there will also be pockets of beautifully decorated homes in areas that are not doing a lot of lighting. 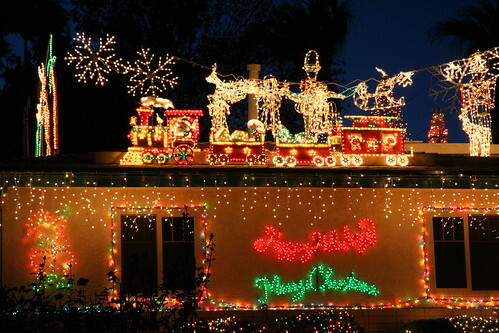 For example, there is a house on Mendel Drive, which is a short cul-de-sac off of Westbury Drive where I live, that has a great Christmas light display every year. Clearly they are in to it too because it changes and grows bigger a little each year. We always walk up there to see what they have done each year. Maybe next year you should knock on one of the doors of one of the houses that's not decorated to ask how they feel about living on a street that gets constant traffic throughout the month of December and ask them if they perceive any downsides. I'm just waiting for one of the idiots driving with his headlights off to hit one of the other idiots walking down the same street with no sidewalks in dark clothing. I don't really care how or whether people decorate their homes and I don't really care that other people want to come and look, but please do drive at a reasonable and safe speed, do NOT turn off your headlights for a better view, and don't walk in the middle of the street in dark clothing with no reflective material. Just saying, it's not all fun and light. I actually AM one of those people to whom you refer... And I love the attention and the displays that the others put it up. It definitely makes it feel more like the holidays to me and I don't mind the traffic and people at all. In fact, I rather like it!